Louth County Council has begun the tendering process for the clean-up of the site, which was discovered two years ago. IT HAS EMERGED that an unauthorised dump discovered two years ago in Louth contains some 500 cubic tons of hazardous waste and could cost the state hundreds of thousands of euro to clean up. The site at a quarry at Cavan Hill was found in September 2011 in a multi-agency initiative involving the county council, gardaí and Customs. A spokesperson for Louth County Council told TheJournal.ie that it was recently determined that approximately 500 cubic tons of material in the 1600 cubic tons of waste at the site is hazardous and is believed to be as a result of an illegal diesel laundering operation. The spokesperson said that it has begun the tendering process for the clean-up of the site, with pre-qualification questionaires for some 50 qualified contractors. Until recently, the scale of the problem had not been fully determined as a garda investigation is ongoing. Though no prosecutions have yet been made, the spokesperson said they were “imminent”. It is expected that the cost of the clean-up will reach into the “mid six-figure range” and the council hopes to recoup these costs from the Department of the Environment, Community and Local Government. Email “Clean-up of hazardous waste site could cost State up to half a million euro”. 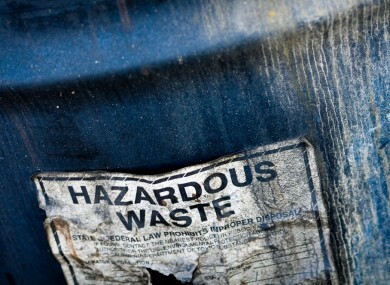 Feedback on “Clean-up of hazardous waste site could cost State up to half a million euro”.